Tilapia is a healthy part of a balanced diet. Abouttilapia.com informs consumers that aquaculture tilapia fish is a nutritious and healthy part of a balanced diet that is high in protein, low in fat and substitutes well in any seafood recipe. Fresh Tilapia are farmed in Ecuador, Costa Rica, Colombia, Honduras and Brazil and shipped fresh daily to the US. Tilapia has been farm-raised as far back as ancient Egypt, and now such farming occurs in more than 85 countries. Tilapia is considered sustainable thanks to its herbivore eating habits, feeding mainly on plankton, filamentous algae, aquatic macrophytes and other vegetable matter. Tilapia is rapidly becoming one of the most popular seafood in the United States, with the National Marine Fisheries Service ranking it the fifth most consumed seafood. In fact, American’s annual consumption of tilapia has quadrupled over the last 4 years, from a quarter pound per person in 2003 to more than a pound in 2007. Researchers predict tilapia is destined to be one of the most important farmed seafood products of the century. Did you know that The American Heart Association recommends eating fish at least twice a week? Tilapia is the common name for nearly a hundred species. Tilapia comes in several colors, but red and black tilapia are the most well-known species. Skinless and boneless Tilapia of any variety cooks completely white, making it an excellent substitute for nearly any white fish, including: sole, flounder, cod, haddock, pompano and grouper. Both types of tilapia can thrive in either fresh or brackish water (mix of fresh and seawater). Tilapia ranks as the second most cultivated fish in the world, after carp. Tilapia is one of the most popular farmed fish in the world and its production is increasing. Most of the Fresh Tilapia Fillets consumed in the US are produced in Honduras, Ecuador, Colombia, Costa Rica and Brazil and imported fresh daily. The US is the largest importer of Fresh Farm Raised Tilapia Tilapia Fillets. Tilapia is fifth most popular seafood in US with a per capita consumption in 2007 of 1.14 lbs. Consumers widely agree that Fresh Tilapia Fillets are an excellent addition to a healthy diet. 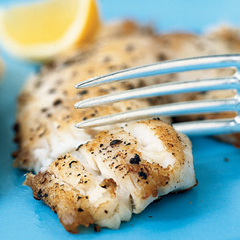 Fresh Tilapia fillets low in fat, low calorie, low carbohydrate and are high in protein. 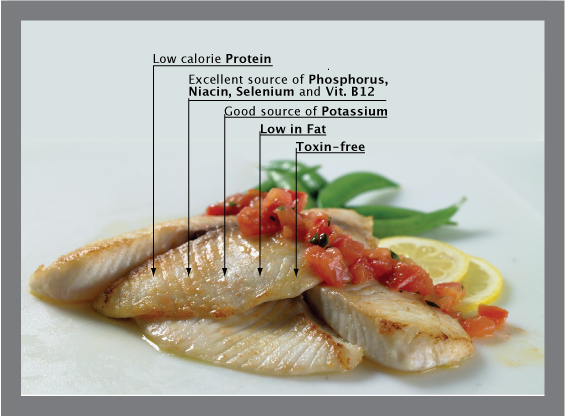 Fresh Tilapia fillets are also an excellent source of Phosphorus, Niacin, Selenium, Vitamin B12 and Potassium.